I would like to endorse the speech by Mr.Tony Marano made on Oct.21 at the Glendale City Council on the Comfort Woman Statue. In it, he referred to a group of former South Korean “comfort women” who served in government-controlled brothels for US soldiers in South Korea after the Korean War. On June 25 this year, they filed a suit in the Seoul Central District Court demanding state compensation for forced prostitution. The Japanese people are angry not only at the Koreans who tarnish the image of Japan but also at the Americans who show a lack of consistency as well as justice/fairness: you listen to one-sided narratives with your eyes and ears closed to the other. I fully support Mr.T.Marano’s proposal to set up another plaque beside the Statue describing what had happed in Korea, provided you believe the coercion of Korean women by Japanese Government/Military were the case. For your information, the Asahi Shimbun, which is considered to be Japan’s most esteemed newspaper, lately admitted for the first time since its coverage of comfort women almost three decades ago that the reports on the coercion of Korean women were based on fabricated accounts and totally wrong. 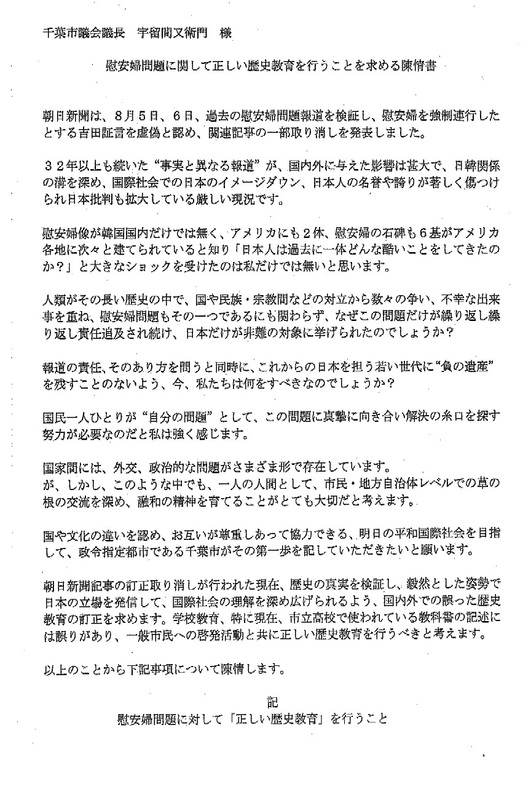 Dozens of such reports have been said to have influenced not a few people in and out Japan including those who initiated the House Resolution 121 in 2007. The Asahi’s admittance, on the other hand, has now ushered in an increasing number of resolutions against the “Kono Statement” at municipal assembly level across Japan. Lastly, I would like to conclude my message with the quotes from Jefferson Davis.